So the son started to follow his father’s advice. On the first day he hammered in 37 nails, but getting the nails into the fence was not easy, so he started trying to control himself when he got angry. As the days went by, he was hammering in less nails, and within weeks he was able to control himself and was able to refrain from getting angry and from hammering nails. 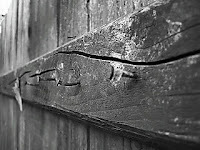 The son started to take out the nails for each day that he did not get angry, until there were no nails left in the fence. He came to his father and told him what he had achieved. His father took him to the fence and said, “My son, you have done well, but look at these holes in the fence. This fence will never be the same again.” Then he added “When you say things in a state of anger, they leave marks like these holes on the hearts of others. You can stab a person and withdraw the knife but it doesn’t matter how many times you say ‘I’m sorry,’ because the wound will remain.